Mercury is the 80th element on the periodic table and has the chemical symbol Hg. Elemental mercury is a silver-white, heavy, mobile, liquid metal at room temperature. 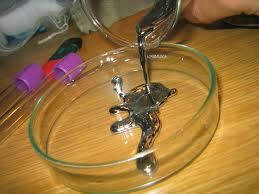 It is the only metal on the periodic table that is found as a liquid at room temperature. Properties of mercury are that it contracts or expands evenly when heated or cooled, it remains a liquid over a wide range of temperatures, it does not stick to glass, and its ability to conduct electricity. Mercury is a fat-soluble toxin. It is, by far, the most toxic metal on the planet AND the most powerful neurotoxin, as well. It is second only to plutonium in its reactivity and toxicity. Unlike other heavy metals, mercury binds tenaciously to the fat-soluble neurological tissue. That’s why it loves to bind to brain neurons – because the brain is over 60% fat. Mercury is always the last metal to be eliminated as it “hides behind” the other metals and lies in the deeper strata of the tissue. Once mercury is in the body it is difficult to remove because it binds very strongly to human tissues. It can have a severely damaging effect on the liver and when in the bloodstream, the liver is unable to process it for elimination. In serious cases, this toxin can accumulate in and suffocate the liver, leading to liver damage or even death. Mercury is a catalyst to infection. It is directly immunosuppressive. Immunosuppression involves an act that reduces the activation or efficiency of the immune system. The steady release of mercury into the environment has resulted in current levels that are three to six times higher than the estimated levels in the pre-industrial-era atmosphere. We can take in mercury by eating fish, which have absorbed it into their tissues from the water. Mushrooms can accumulate high levels if grown in contaminated soils. Some dental amalgam fillings contain mercury. Metallic mercury is also used in a variety of household products and industrial items, including thermostats, fluorescent light bulbs, barometers, and glass thermometers. Looking at all the things that contain mercury, it is pretty obvious that we all have been exposed to it in one degree or another. But how well is our body eliminating the mercury it comes in contact with on a daily basis? Some people have the genetic ability to easily detoxify mercury and eliminate it from the body, while others are genetically susceptible to its accumulation even from low-level, everyday exposure. How do I get rid of the heavy metals in my body? A substance is “chelated” when it is grabbed, trapped, and transformed by a chelating agent. The chelating properties of humic acids have been exploited for a long time in the purification of wastewater. In effect, the unique formulation of humic and fulvic acids in Humifulvate® acts like a magnet for the large atoms of heavy metals, capturing them so they can be flushed out of the body through normal processes of elimination. moss and is in a natural conservation area free from industry or agriculture. AIM HumiKleanse® is a natural chelating supplement that helps your body rid itself of heavy metal accumulations while enhancing the body’s ability to utilize trace minerals. AIM’s product contains Humifulvate®, a unique combination of humic and fulvic acids, which act like a magnet for the large atoms of heavy metals. Once captured, they are flushed out of the body through the normal elimination process.